If you are signed up for one of those fancy cable TV plans, chances are you get more TV channels that you could possibly keep up with. Life can be so hectic that you might even forget about catching your favorite TV shows when they are on. 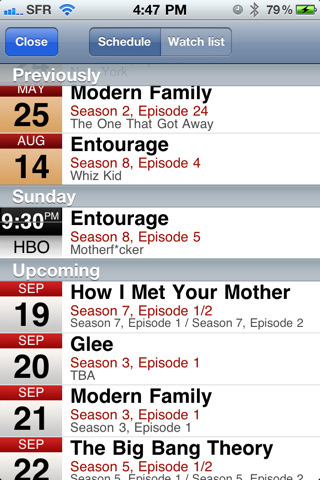 TV Show tracker is an iPhone application that can help. It keeps track of your favorite TV programs and alerts you when they are on TV. TV Show tracker, as the name suggests, has everything you need to keep up with your favorite programs on TV. It shows you the list of all episodes announced for TV shows. You can get a quick overview of each episode. Video previews are offered too. Users can mark the episodes they have seen to avoid watching the same one again. 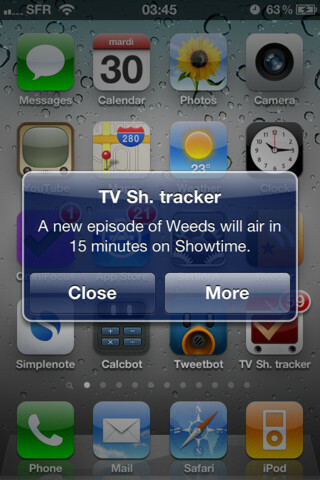 TV Show tracker not only alerts you before and after your program has aired, it makes purchasing episodes from iTunes easy. TV Show tracker is a TV program discovery tool too. Just shake your device to get program suggestion based on what you have watched in the past. 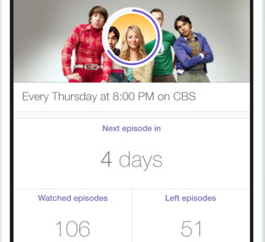 If you have ever had trouble keeping up with your favorite TV shows, TV Show tracker is worth a consideration. The app did crash on us a couple of times. The idea is very promising though.